In 2013, Haemophilia Scotland played host to a group of about a dozen young Russian men with bleeding disorders. They had were successful finalists in a competition where the prize was a two-week visit to the UK. The once-in-a-lifetime opportunity enabled about many of them to travel abroad for the first time. 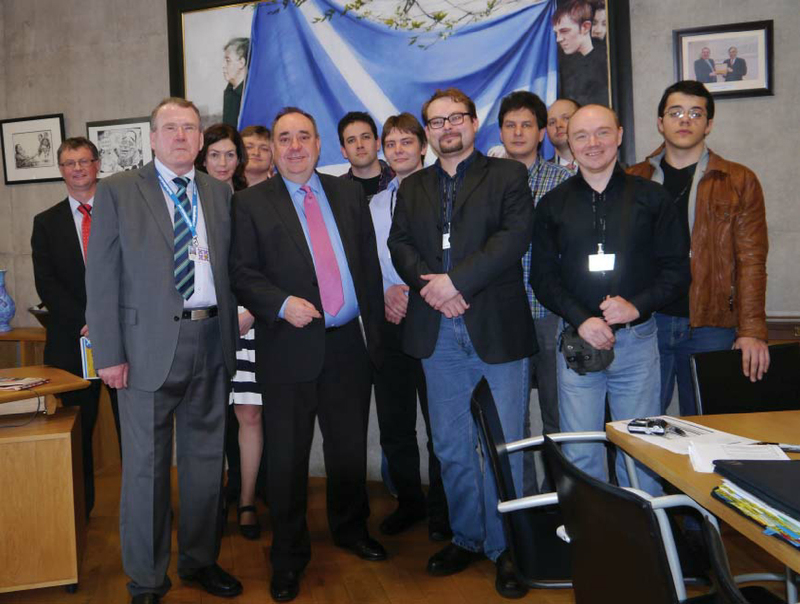 Richard Lyle MSP and the First Minister, Alex Salmond, meet the Russians at Holyrood during their stay in Scotland. Also featured are Haemophilia Scotland Chairman Bill Wright and Vice-Chair Susan Warren, who organised the Russian group’s visit. They spent time in London and Scotland, meeting other people affected by bleeding disorders and enjoying new experiences. While in Scotland they visited the Scottish Parliament in Holyrood, where they met First Minister Alex Salmond. In Inverness they took part in a traditional ceilidh. Susan Warren looked after the group throughout their time in the UK and made them very welcome. We hope to organise a return visit soon.